I received an email from LinkedIn a few days ago. The site has marked 1 million members in the Philippines. A screenshot of the email is available through the image below. Just click on the photo for a larger view, in case you’re having a hard time reading it. The email featured a greeting in the Filipino language – “Kamusta” followed by my first name. 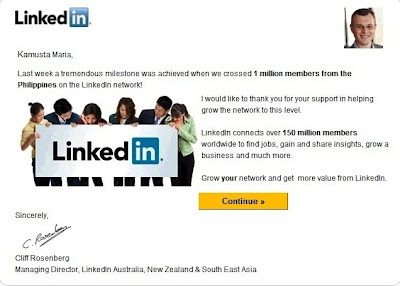 Cliff Rosenberg, LinkedIn managing director for Australia, New Zealand, and South East Asia is sending the message. LinkedIn is sending a general message for all members who had been a part of the site’s 1 million member’s growth in the Philippines. So why did I bother adding as many information as I can? At first, I thought of using the site as an online portfolio for writing gigs. I would refer potential clients to my LinkedIn profile for a complete record of my work experience. Although most sites can already provide an ample space for anyone to build a profile, it’s difficult and time consuming to write comprehensive profile info for all sites. So instead of creating one for every single site, I thought of writing down everything in LinkedIn and referring buyers from varying sites to my LinkedIn profile instead. So far, the idea works well and I see profile views coming from oDesk, Fiverr which I only registered for recently, and other places online. In fact, aside from fellow freelancers connecting to me via LinkedIn, there were also a few clients who had offered possible job opportunities through the site. How can you make the most out of LinkedIn? LinkedIn serves as a means to grow your business or an option to find employment opportunities. The latter serves me well. For everyone who owns a business, whether online or not; LinkedIn can be utilized for various purposes. You can use it when in search of employees, customers, and business partners. Just know how to use the search functionality well and you’re off to a good start. If not, you can rely upon the site’s automatic recommendations for you based on commonality in terms of interest, networks (members), jobs, or companies you are associated with. You can also post job offers for LinkedIn members. Unlike freelancing sites where bidding is necessary and payment details are available, LinkedIn simply provides the platform where the job offer can be posted and where you can interact with interested potential employees through the site’s messaging system. All other details which both parties need to agree upon including payment concerns can be discussed outside the site. Better than what freelancing sites can host, LinkedIn employment opportunities are not contract or project based. The site can open doors to a permanent job position. It can be web based or through an actual office. So if you are a business owner, you can find employees through the site. Likewise, you can also utilize LinkedIn to promote your business and find customers who are interested in the industry your business is categorized under. You won’t have to search far and wide; the site’s recommendation process will introduce members and even groups who can become possible customers for your product or service. LinkedIn will also help grow your network for employment purposes. You can use it to host a portfolio of experience, etc. when applying for freelancing jobs online. See section ‘How LinkedIn Helped Me’ for details. The same portfolio can also serve as your online resume when applying for permanent and more stable job positions both online and in actual offices within your location. If you’re not on the site yet, you can register now and provide as many information as you can in order to increase your profile completeness level. Some of the sections you need to fill out include the heading (what’s prominently displayed on top of the page), summary, skills & expertise, experience, education, recommendations (you need to ask someone already added in your work experience for a recommendation) and additional information. The latter includes your website, if any and groups you have joined within the site. The order by which these appear can be rearranged when you edit your profile. It is recommended to have your profile completed in order to increase the chances of growing your network, whether it is for business or personal use. As for me, I’ve provided almost all details needed to complete a profile except for one. Aside from filling out all sections, there is a need to add more members within your network (at least 50) in order to reach 100%. Unlike me who simply waits for others to add me, you can invite other LinkedIn members instead. As mentioned, you can check out the recommendations sections or you can manually search for people. You can even find your own email contacts and see if they are already on the site. That’s how I got my first few connections on the site. Joining groups is also one sure fire way to have your network grow. Most groups exist for discussions but in some cases, job opportunities are also available. These groups can be manually searched or you can try the suggested groups list on the right hand side of the home page. All other recommendations can be found here too including people you may know, ads, jobs you may be interested in, groups you may like, and companies you may want to follow. The phrases used are exactly how they appear on the right side of the home page. LinkedIn can also be linked to other sites including Twitter where you can automatically tweet new updates you post on your LinkedIn accounts. Post anything you want, professional or not, the way you do so with other social network sites. Other work related sites are also linked to LinkedIn. You can easily complete your profile in such sites by simply connecting them. Some of such sites include Skill Pages and Staff.com. I only discovered so when I signed up for these 2 sites. Both of which deserves a separate write-up in the future. With more than 150 million members worldwide, LinkedIn provides a portal for businesses to grow and for job seekers to find employment. Either way, you can start building your network by joining today.